Bonjour. Je cherche l'acte de mariage 14/04/1654 et l'acte de sépulture (après 28/06/1702) de Jean Gobeil marié à Jeanne Guyet, fils de Pierre Gobeil et Catherine Chaigneau. Il est né le 14/10/1627 (J'ai l'acte de baptême). Merci de votre aide. 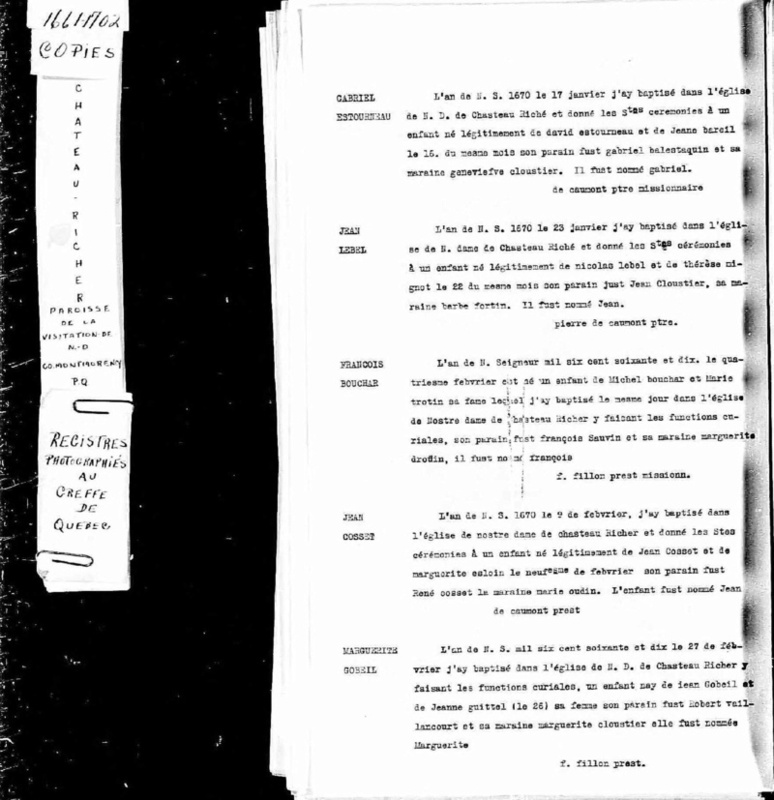 Remarques Les actes suivants sont à St-Liguaire (Ste-Marie-Madeleine) (79266). Quatre filles sont baptisées, puis pionnières : Marie-1, 25-01-1655; Françoise, 16-01-1656; Marie-2, 02-04-1659 et Jeanne/Jeanne-Angélique, née 1663 (3 ans en 1666). 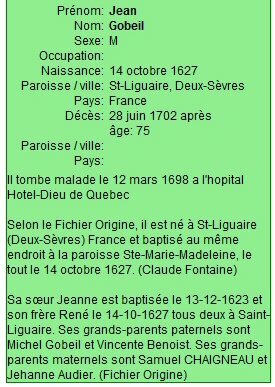 Ses frères et soeurs sont baptisés : Jeanne, 13-12-1623; Renée, 05-03-1626; Pierre, 11-11-1633, marié à Ste-Pezenne (79287), auj. Niort, le 08-07-1657 avec Catherine Dejoust (Jean et Françoise Moynard); Louis-1, 10-03-1630; François, 11-01-1637; Marie, 13-11-1639 et Louis-2, 07-02-1645. Ses grands-parents paternels sont Michel Gobeil et Vincente Benoist. Ses grands-parents maternels sont Samuel Chaignaud et Jeanne Andrée. J'avais cette information. Merci quand même pour vos efforts. Voici le résultat concernant Jean Gobeil et Eanne Guiet. Plusieurs Généalogiste ont travaillé sur le sujet au fil du temps. IL EST MENTIONNÉ QUE L'ANCÊTRE EST DÉCÉDÉ VERS 1702 ET NOUS IGNORONS L'ENDROIT DE SA SÉPULTURE. IL FAIT PARTIE DES FAMILLES SOUCHES DE L'ÎLE D'ORLÉANS. UNE PLAQUE AU NOM DES FAMILLE SOUCHES EST LÀ À L'ÎLE D'ORLÉANS. Jean Gobeil arrived in Canada without fanfare, accompanied by his wife Jeanne Guyet and his five children. For more than a century, serious researchers tried to determine the place of origin of this Canadian family. Msgr Cyprien. Tanguay states that Jean and his family were originally from St-Didier, diocese of Poitiers. Others add:Saint-Didier of the town of Poitiers, today a parish no longer in existence. 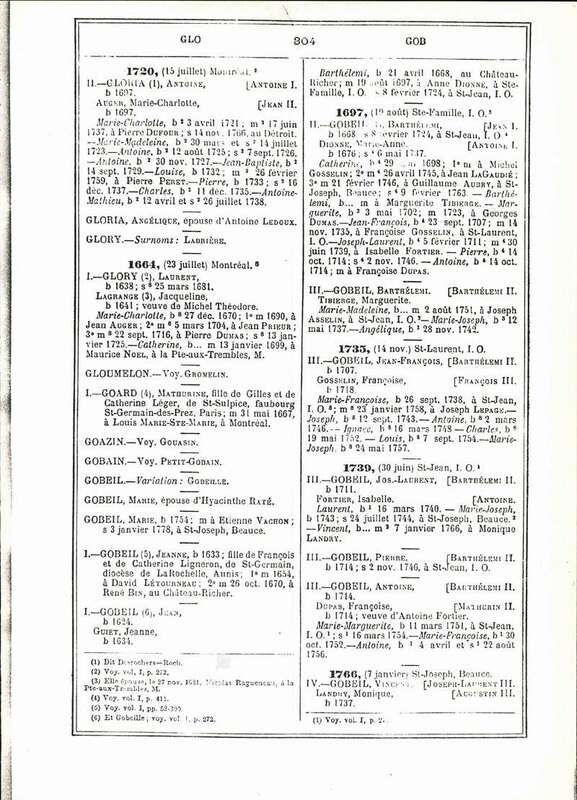 Rene Jette, in his recent genealogical dictionary, issues a new opinion: Jean Gobeil, fromSt-Andre, town and arrondissement, of Niort, diocese of Poitiers. Niort, presently the head town of the department of Deux-Sevres, has a population of 56,000 inhabitants. Until the conquest of New France by England, the Canadian fur trade gave Niort prosperity. Four parishes share the territory of the city: Notre-Dame, St-Hilaire, St-Etienne and St-Andre. It was in this last parish that the Guyet-Gobeil couple's life began, before 1653. Had Jean Gobeil saved some money in order to go to the Lower-Town of Quebec? Did he come with a promise of work or without contract? We find him for the first time on 23 December 1665, in the presence of notary Auber from Chateau-Richer. Sieur Toussaint Toupin, a bourgeois of Quebec, agreed to lease him a farm at Sault-a-la-Puce for five consecutive years, beginning on the preceding first of November. Jean Gobeil was said to be a laborer. The new farmer began with a house and buildings to shelter 2 steers, 3 cows, I bull and 2 calves. This incomplete record ends on the second page. We have to wait a long time to know that Jean was responsible for the animals and that he must pay the agreed price should some die due to lack of care. In addition, the first year, in other words at the end of 1666, Gobeil paid the equivalent of 20 livres in butter for the price of the lease of each cow and 10 livres for the four following years. The neighbors of the Gobeils were an Cloutier, owner of six arpents of frontal land since 16 July 1652, and Nicolas Huot dit St-Laurent. It was here, near the heart of the future parish of Chateau-Richer, that the Gobeils lived for five years on these six arpents of frontal land. 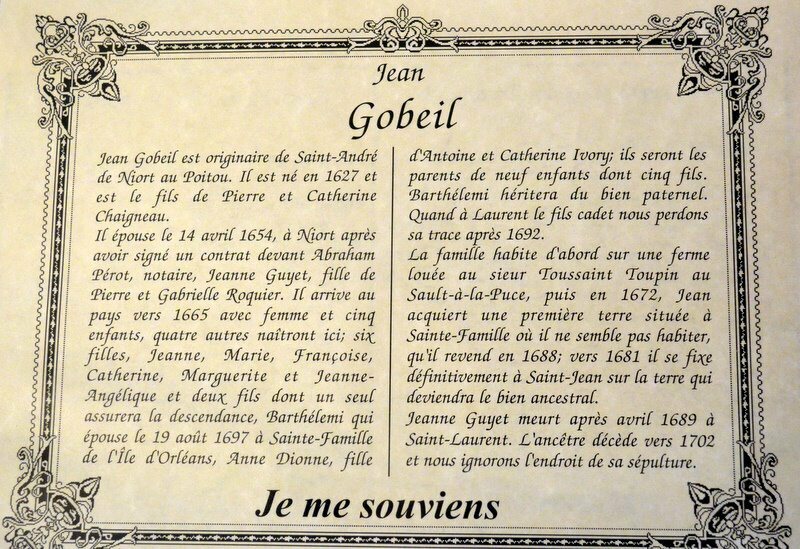 During the following winter, on 21 February 1666, the 42 year old Jean Gobeil, was confirmed by Msgr de Laval at Chateau-Richer. Marie and Francoise Gobeil, his daughters, were also in this group of twenty-one. The censustaker in the year 1666 places the Gobeil family on the Beaupre Coast. The censustakers in 1667 give more details. Jean already owned 12 head of cattle and had 16 arpents of land under cultivation. Near his farm, there was the homestead of Julien Fortin and that of Jean Cloutier. Then, in 1668, Marie Gobeil was married to Robert Vaillancourt. The following year two other daughters left the paternal home -to get married. But two new Canadian Gobeil children came to replace those who had left: Catherine and Barthlemy. A tenant is never completely in his own home. After five years of work, Jean Gobeil looked across the river towards the beautiful Ile 'Orleans. The north coast had more abundant and larger wild game and the soil of the island was more fertile. On 28 October 1669, with is son-in-law Robert Vaillancourt, Jean bought a piece of land from Noel Rose. It was located on the Ile d'Orleans, in the parish of Ste-Famille. And on the following 7 November, Jean obtained the three remaining arpents on which there were some buildings and two arpents of cultivated land. This entire property had belonged first to Jean-Paul Maheu and Barthelemy Verreau dit LeBourguignon, then to Noel Rose dit Larose, husband of Marie Montminy. At the time of this purchase, their neighbors were Robert Vaillancourt and Nicolas Patenotre. The purchase price: 300 livres, 87 of which were immediately given to the teller. The remaining debt was to be paid off in two years. It is difficult to verify if Vaillancourt and Gobeil had decided to live on the island right away. The scenario could have been: Gobeil would spend the winter atChateau-Richer; Rose on the island. During the winter Vaillancourt and Gobeil would probably cut wood on their new lot. In the spring, Noel Rose moved to the Saint-Charles River where he obtained a concession from the Jesuits at Sainte-Anne in 1670. The Gobeil property was located across from Chateau-Richer, to the west of the present church of Ste-Famille, near the boundary of the parish of St-Pierre, according to the map of Robert Villeneuve. How to explain that on 14 January 1672, in another contract signed by Romain Becquet, Jean Gobeil, "habitant living on the ile dorleans," bought the same parcel of land from Noel Rose for 280 livres? Had he not been able to pay his mortgage? In fact, on 14 January 1672, Gobeil acquired his property by means of a loan from Nicolas Huot dit St-Laurent. Jean gave an annual rent of 14 livres tournois to St-Laurent. Jean resold his farm on 16 March 1688 to Claude Panneton dit LeFifre, for 300 livres. Let's remember that on 16 March 1686, Jean Gobeil had not managed to pay off his rent of 14 livres and the arrears. Charles Aubert de La Chesnaye took care of it. For the first time, it was said that the Gobeil land was located at Pot au beurre, a popular name for a part of the parish of Ste-Famille. Jean Gobeil had the characteristics of a nomad. Did he suffer from the fidgets? Perhaps also the weight of the years tired him. In the census of 1681, Jean was 57 years old, settled in the parish of St-Jean, on a piece of land with five arpents in frontage, with neighbors Antoine Leblanc and son-in-law Philippe Paquet, the husband of FrancoiseGobeil. Jean only had five arpents of land under cultivation. The censustakers noted no cattle in the stable. We are definitely not at the Palace of Versailles. The children, with the exception of two, earned their living elsewhere. It seems that the letters of acquisition for this concession have been lost. Jean and Jeanne Guyet worked hard on their farm for several years more, before bequeathing their inheritance. In 1695, twenty-five arpents, in area were under cultivation. The necessities of life allowed for no vacations nor any rest. When the Gobeil couple crossed the ocean, they were accompanied by five daughters born in France. Two other daughters and two sons were born in Canada. Here are the names of the members of this second generation: Jeanne, Marie, Francoise, Marie, Jeanne-Angelique, Catherine, Barthelemi, Marguerite and Laurent. I. The oldest, the little French Jeanne, was married about 1669, probably at Chateau-Richer, to the soldier Pierre Philippe, originally from the Vendee, in Poitou. This family left no descendants. Jeanne, if there is no mix up with her sister Jeanne-Angelique, appeared is godmother of niece Jeanne Paquet, on 5 November 1676, at Ste-Famille. In 1687 at St-Pierre, she became the godmother of Francois Vaillancourt. As for her husband, we find him on the long list of 279 people confirmed at Quebec on 4 April 1684. 2. The history of Marie, born about 1655, is known to USA through that of her fiance Robert Vaillancourt and through her twelve children, all born and baptized at the church of Ste-Famille on the island. 4. The biographical account of the ancestor Pierre Hudon dit Beaulieu, at the same time, gives USA an account of Marie(2) Gobeil, born about 1659, married on 13 July 1676 at Quebec, mother of twelve children at Riviere-Ouelle. After the death of her husband in 1710, she looked after her family for a quarter of a century. Her burial was at Riviere-Ouelle on Monday, 26 November 1736. How to explain that a girl from the island could become the servant of Jacques Leber, a notable merchant and land owner, at Montreal? On 4 July 1690, we find her again, ill for two days at the Hotel-Dieu of Quebec. She then said she was 23 years old. 5. The following year, Jeanne-Angelique met Louis Prat, living in the Lower-Town of Quebec. The wedding took place at the cathedral on 30 July 1691. Louis Prat was a good fellow, an innkeeper, a merchant-baker, a ship owner and the port captain of Quebec. In 1704, he built the ship le Joybert. "A few months after it was launched, the vessel returned triumphantly to Quebec, bringing the Pembroke Gally, a frigate taken from the English. This period is remembered in a painting dated from 1706 given to the sanctuary of Sainte-Anne-de-Beaupre. " In 1716, Louis and Jeanne-Angelique were living in the Rue Sous-le-Fort. The couple had three daughters, one of whom survived, Marie-Josephe, and was married to Charles-Paul Denis, Sieur de Saint-Simon, on 17 October 1713, at Quebec. Louis died in February 1726 and was buried in the cathedral. 6. Catherine, the first Gobeil to be born in New France, on 26 March 1666, was also a servant at the home of the fur merchant and founder of the Compagnie A Nord, Jacques Leber, in Montreal. She died as a result of the epidemic at the Hopital-General de Quebec after 11 February 1703. 7. Barthelemi, the seventh Gobeil child, was the only one to carry on the name. Godson of Barthelemi Verreau, on 21 April 1668 at Chateau-Richer, a servant at the home of Francois Belanger in 1681, he moved into the Dionne family by marrying Anne, daughter of Antoine and of Catherine Ivory, on 19 August 1697, at Ste-Famille. They had nine children, five of whom were sons, at St-Jean. Barthelemi inherited the paternal property. He died on 7 February 1724, after a long illness, fortified by all the sacraments. 8. Marguerite Gobeil, was baptized at Chateau-Richer on 27 February 1670. At the age of 18, she became the life companion of ancestor Guillaume Montminy, from Rouen, on 25 February 1688, at St-Jean. Seven children were given to them, including two born at La Durantaye. The burial act for Marguerite is found in the registry at Beaumont, on the date of 4 March 1715. 9. The youngest, Laurent Gobeil, became the godson of Nicolas Huot dit St-Laurent on 5 November 1672, at Ste-Famille, and disappeared into the darkness of history, after 1697. And so the second and sympathetic Gobeil generation lived and died on the soil of their adopted country. On 23 August 1695, Jean sold the farm to his son Barthelemi. This consisted of 25 arpents of cultivated land with his "sorry " house, his stable, the animals and his barn. His son immediately paid him 300 livres "in playing card money" which was legal tender at that time. Francois Genaple placed the document of this last sale in his notes at Quebec, in the presence of witnesses Nicolas Moreau, living on "rue saint nicolas," and Jean-Baptiste Peuvret, head clerk of the Sovereign Council. Son Barthelemi was still a bachelor. This ancestral land remained in the Gobeil family hands at St-Jean through the whole of the French regime. The special thing about Jean Gobeil's situation is that he imposed 10 conditions at the time of the signing of his sale contract. Should we conclude that his son had verbally promised his elderly father to keep him at his home? Yes. We know that Jeanne Guyet died after 27 April 1689, the day on which she attended the burial of her Montminy grandson born dead, at -Laurent. This was the last notation of her presence among USA. Jean Gobeil stayed eighteen days at the Hotel-Dieu de Quebec during the months of January and February 1698. Then his story goes out like a beautiful candle at twilight. Jean Gobeil entered this country without announcing his arrival and he left it without leaving a trace of his departure. It may be likened to the stalk of an olive tree which disappears imperceptibly after having accepted new stems to replace it. The only known variation of the name Gobeil is Gubby. 1) Records of Auber, 23 December 1665; 7 November 1669. 2) Record of Becquet, 14 January 1672. 3) Record of Genaple, 23 August 1695. 4) Records of Rageot, 16 March 1686; 28 June 1690; 13 July 1690. 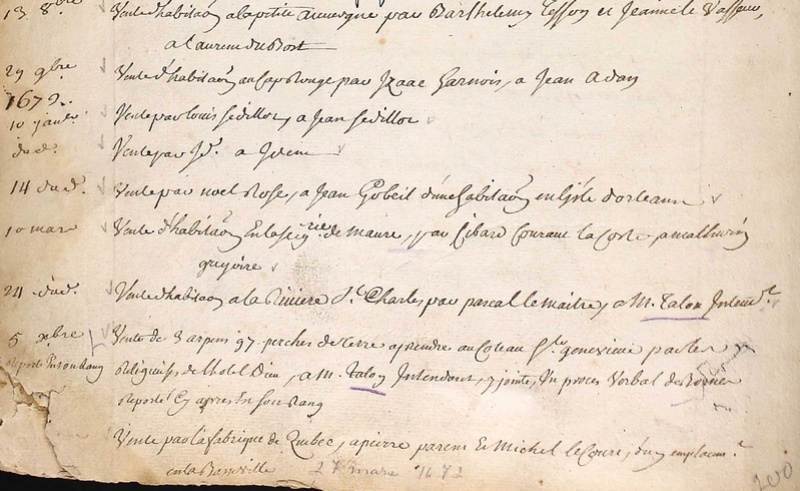 5) Record of Vachon, 16 March 1688. 6) Dussault, Eugene-F., Les Toupin du Sault (1976), page 36. 7) Hollier, Robert., La France des Canadiens (1962), page 120. 8) Jette, Rene., (1983), pages 506-507. (1981), page 266; RAVO 1716 & 1744 (1983), pages 68, 188. 12) Tanguay, Cyprien., DGFC (187 1), Volume 1, page 272. 13) DBC, Volume 2, pages 554-555, Louis Prat. 14) MSGCF, Volume 15, page 45; Volume 26, pages 173-183. He was from St-Andre, v. et ar. Niort, ev. Poitiers, Poitou (Deux-Sevres), France. He answered that he was 42 in 1666 and 1667 and in Beaupre (Chateau-Richer), and ansered that he was 57 in the 1681 recording living at the Isle Orleans. Confirmed on 21 Feb 1666 in Chateau-Richer, QP. He answered that he was 42. He was cited as being in Hotel-Dieu, Quebec, QP, on 12 Mar 1698 and age of 67. First mention with the country: 1665; Occupation with l' arrival: Migrating Date of marriage: 14-04-1654; Place of the marriage: St-Liguaire (contract Abraham Perot); United: Jeanne Guyet Death or burial: After 28-06-1702 Note: Its S œ ur Jeanne is baptized the 13-12-1623 and his/her Rene brother the 14-10-1627 both in Saint-Liguaire. 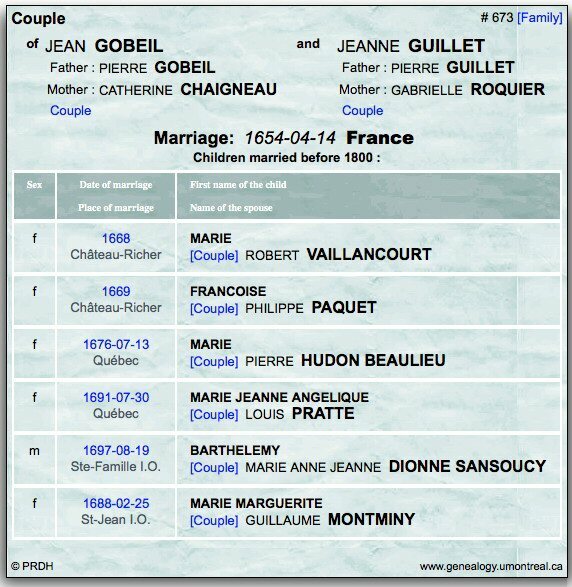 His/her paternal grandparents are Michel Gobeil and Vincente Benoist. His/her maternal grandparents are Samuel CHAIGNEAU and Jehanne Audier. Merci infiniment pour toutes ces informations. Ce dossier est donc clos.